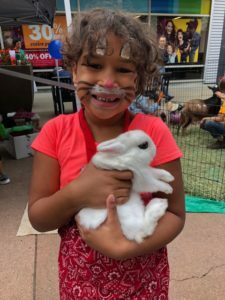 This year, our club was invited to participate in Old Navy’s annual Kid Safety Event. 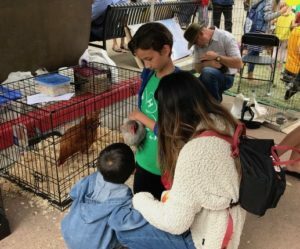 We arrived at Bay Street in Emeryville with rats, chickens, rabbits, goats, and the intent to spread the word about 4-H to families attending the event. Down the closed-off street from us there were all sorts of safety-related activities that kids of all ages could partake in – including exploring the inside of an ambulance and a fire truck. 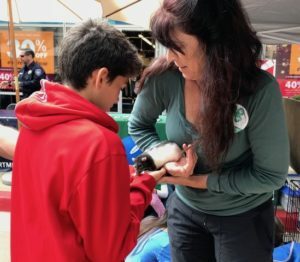 Interested festival-goers could even learn about the Emeryville police department from an actual detective on the force. Face-painted kids were drawn into our booth to feed the chickens and enter the goat pen. This event proved to be a great outreach opportunity for our club as their families followed suit. We told them all about what 4-H has to offer in youth development and invited them to come check us out at the next meeting. We handed out flyers about our club and pocket first-aid kits that displayed the 4-H logo. There’s a Rat on Me!